Four feet of replacement wire for the Hot Wire Foam Cutter. N-Scale Ballast Spreader. Shapes ballast quickly and easily. Made of non-breakable nylon. STRAIGHT SOLDERING TWEEZERS. Save time and keep the glue away from your fingers. The Straight Tweezer is self-closing and designed with a chrome needle-nose tip with serrated jaw. Handle grip is made of rosewood. Nothing slips away from these jaws! 45-DEGREE SOLDERING TWEEZER. Save time and keep the glue away from your fingers! The 45-Degree Tweezer is self-closing and designed with a chrome 45-degree tip with serrated jaw. Handle grip is made of rosewood. Nothing slips away from these jaws! 90-DEGREE SOLDERING TWEEZER. Save time and keep the glue away from your fingers! The 90-Degree Tweezer is self-closing and designed with a chrome 90-degree tip with serrated jaw. 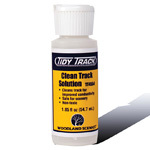 Rail Tracker® Clean Track Solution - Use Clean Track Solution with Cleaning & Finishing Pads. Safe, non-toxic and water soluble. 1.85 fl oz. Foam Pencils are ideal for drawing on a variety of surfaces, including wood and SubTerrain foam products. Replacement Blades for the SubTerrain Foam Knife. Four (4) Pieces. Now you can replace the 3 AAA battery pack that comes with your kit and use one of our wall mount AC adapters. 4.5volt AC/DC adapter, will run up to 3 animated signs. Not recommended for non-animated signs! Use foam nails to firmly hold SubTerrain Risers in place and many other uses. Insert Foam Nails at an angle for best holding ability. Set contains 75 Pieces. 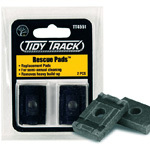 Rail Tracker® Rescue Pads - For semi-annual cleaning to remove heavy build-up. Two replacement pads per package. Rail Tracker® Maintenance Pads - Replacement pads for routine cleaning to remove grime and oxidation. 2 replacement pads per package. 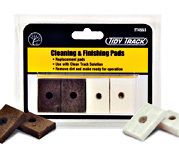 Rail Tracker® Cleaning & Finishing Pads - Replacement pads. Includes 8 Cleaning Pads and 8 Finishing Pads. Rail Tracker Rail Pal - Use to smooth track imperfections and remove dirt and track contaminants such as paint, adhesives and grime. Superior Quality! X-tra Long Needle Nose Pliers features a 2 inch non-serrated tip, foam grip and drop forged hardness. Tweezers with protective tip with extra long reach. 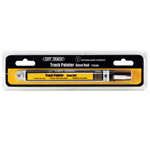 Woodland Scenics Low Temp Foam Glue Gun should only be used with the specially formulated Low Temp Glue Sticks. 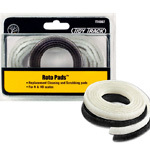 Rail Tracker® Roto Pads - HO-Scale and N-Scale Roto Wheel Cleaner Replacement Pads. A SubTerrain knife can be used for cutting foam. Tidy-Track® Track Painter - Steel Rail - Transform shiny rails and clean ties easily to look as realistic as the rest of your layout. Painting pen with flat enamel weathering colors. Works for all scales. Each pen includes an extra detail tip!